We are a world away from that snowy night in Twickenham when Ireland hit their highest height of the Joe Schmidt era to claim their Grand Slam with a relentless, excellent performance. Brisbane in winter is a very different place and, as they approach the end of a thoroughly successful season, the Irish players could be forgiven for feeling like they are in bonus territory. And yet they have more to do before they can hit the beach and reflect on their glorious year. A series win in Australia would sit very nicely alongside all of the other achievements of an unforgettable 2017/'18 campaign. Unbeaten in 12 Tests, they arrive with a formidable squad featuring a legion of players who have tasted double success with Leinster. Confidence will not be in short supply. The home team are making positive noises, but on the ground there is nothing but doubt. The locals fear a series defeat is on the cards. Rarely, if ever, has a squad from Ireland arrived with such expectation on its shoulders but they appear to be comfortable with it. Since the Rugby World Cup in 2015, Ireland have won 73pc of their matches. In the same time period, Australia have managed 45pc. Sure, they face New Zealand more often than anybody else but they have shared the load and six of their 13 defeats have come on home soil. Michael Cheika has used that period to blood 27 new faces, but so has Schmidt who has introduced 33 debutants in the same time-frame. Undeniably, this Ireland team are in a better place in their development and the head coach is confident enough in his squad to make changes to his starting XV. Handing Joey Carbery the starting jersey is a bold call by a coach firmly in his comfort zone. Given it is the end of a long season, there would be no major backlash if they failed to win the series but the coach wants his team to continue on their upward curve and a victory over the Wallabies would be another feather in the cap. His decision to make changes could be interpreted as over-confidence, but he has balanced the new faces with experience around them and his bench is the ultimate security blanket. If Ireland are in trouble, Tadhg Furlong and Johnny Sexton will be on early to steady the ship. They are determined to keep up their habit of starting fast. Managing the scoreboard and forcing teams to chase games plays into Ireland's hands and they possess a rare capacity to score in and around half-time. Carbery's control is key, but he has experience around him and he will also be encouraged to play. 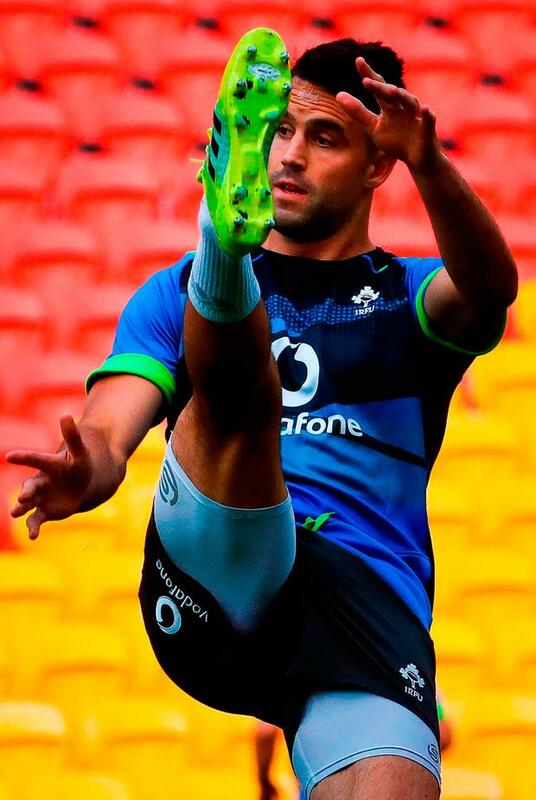 With his quick feet and eye for a break, he can cause the Wallabies problems. The youngster is raw, but has shown in snippets that he can thrive at this level. This morning, he is asked to put together a more complete body of work. 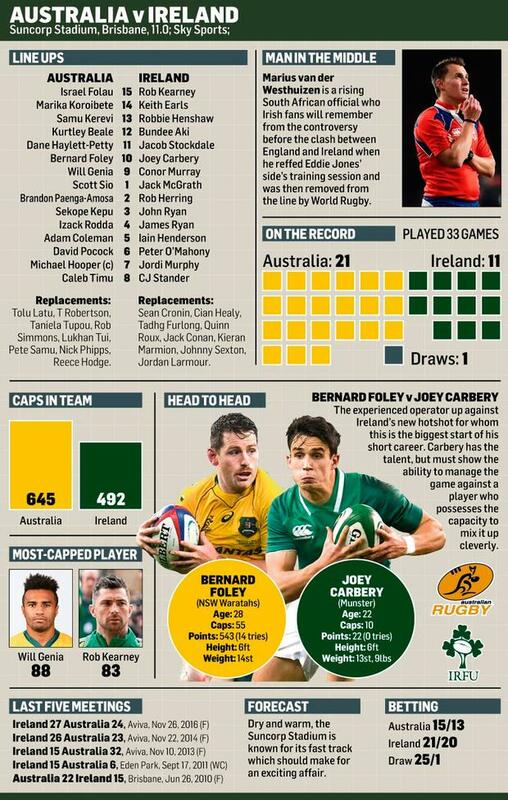 Australia possess the kind of wide threat that has hurt Irish teams in the past and Ireland have been on message in hailing their attacking prowess all week. Captain Michael Hooper was not hiding their desire to play with width yesterday. "We'd be silly not to run the ball with some of the strike power we've got," he said. "We've got a really fit team - forwards who want to work and get over the advantage-line. We've a mobile back-row and we've seen during the Super Rugby season some of the damage that the backs can do and some of the form that our playmakers are in. "We've got to be smart in how we do it. Some of this stuff needs a little bit of a tweak sometimes in how we relieve pressure at times because we know that the Irish are good - they build pressure. "We saw what they did to some teams in the Six Nations, how they can put up a kick anywhere on the field and keep putting pressure on you so how we deal with that is critical. Now I think we've got a great ability to run it from everywhere tomorrow night but doing it in smart ways is crucial to minimising the risk." The tourists will see defensive weakness in the Wallaby rearguard and they will be quietly confident of winning the physical battle up front. If they can deny Will Genia and Bernard Foley quick ball, they'll be on to a winner. Hooper and David Pocock will be out to slow Ireland down themselves, but the quality of the Irish carry has been successful in negating breakdown threats all season and they'll back themselves to get over the gainline and make life difficult for the local fetchers. If Ireland's set-piece functions and their breakdown work is strong, they will back themselves to create enough chances to win the game. It won't be easy. Ireland's last two wins over Australia were both three-pointers at home and while they are nursing all of the bumps and bruises a long season brings, their opponents are fresh. Still, the first Test looks eminently winnable for a team packed with power and potential. It wouldn't be a disaster, but they won't want to contemplate defeat after all that they've achieved this year.